In these last few days before summer, spring radishes are at their best: firm, crisp, and peppery. You can get particularly vivid, crunchy ones from Queens County Farm Museum, among other Greenmarket stands. Buy them fresh and use them quickly, like chef de cuisine Pablo Osorio does at Thirstbaràvin in Crown Heights, where he pairs the root vegetable with an anchovy-and-garlic sauce that lessens the bitter astringency of the radish and ups the flavor ante. Chop anchovies, and place in a bowl. Crush spring garlic, then add paste to bowl. Mix in mustard, red pepper, vinegar, and lemon juice. Whisk in olive oil, and season with salt and pepper. 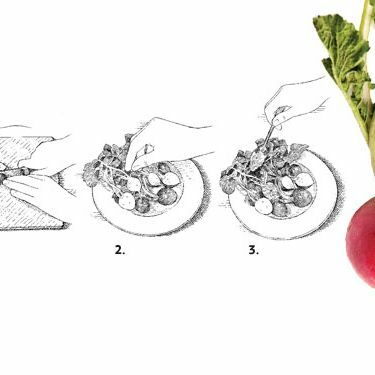 (1) Slice radishes in half, leaving tops attached, and (2) plate with a sprinkle of coarse salt and pepper. (3) Spoon anchovy sauce over radishes and tops. Serves six.